Today is International Tiger Day, so I thought I needed to give a shout-out to some of my favorite animals. First and foremost, let’s get the adorable pictures out of the way. Adorable doesn’t even begin to describe this cub. Not enough cuteness for you? Then I recommend you head over to Mother Jones and check out their whole page dedicated to the beautiful creatures. Don’t worry, I’ll wait until you get back. Got to get the Aww! out of your system after all. The tiger is revered, feared, compartmentalized, and idealized. There is a main story, but mixed throughout are backgrounds for the various people whose lives were affected, as well as fascinating tales of the various tigers that our main forest ranger has encountered. I learned a lot about Russian history and its economy in this book, as well as all the temperamental relations that have existed in the past with her neighbors. 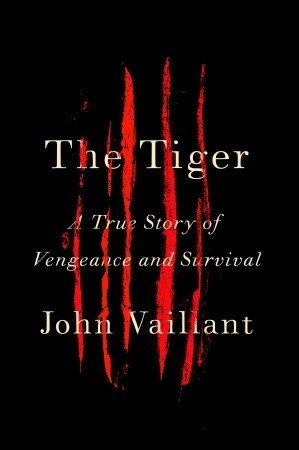 The book is also peppered with adventurous tiger stories (besides the primary tale), even from a few survivors, and you learn how intelligent, territorial, and vengeful these animals are. These sections were by far my favorite parts of the book, and made for some entertaining discussions around the dinner table. As frustrating as the structure was at times, listening to it in audiobook format made the Russian names, terms, and locales easier to understand and I didn’t feel daunted by the language as much as I think I would have been had I read this in paper/ebook format. Overall a fascinating book about a beautiful but dangerous predator. Another good source for information on not only the Siberian tiger but also the people of the Taiga is the documentary titled Happy People (available on Netflix), which walks you through a regular working day for people who live among the largest land man-eaters on the planet. You really get a good taste for the environment in Vaillant’s The Tiger, but it really hits home to see the reality of it. Not only do you see how they have to create makeshift traps in the woods but you also watch them make their own boats, all using the simple but reliable tools at their disposal. Finally I’d like to leave you with some excellent places that work with tigers on a regular basis. Big Cat Rescue in Florida. 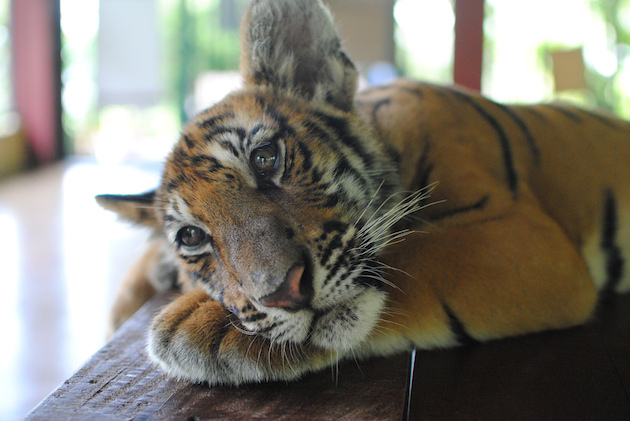 A wildlife conservatory for big cats that are rescued and given a happy home. The video and pictures they post on a regular basis will make your heart melt. Noah’s Ark in Georgia. I have a special fondness for this non-profit located right around the corner from where I live. They take in all sorts of animals, not just tigers. Recently they took in a bunch of dogs that were removed from a puppy mill, got them cleaned up, gave them medical exams, and will soon be adopting them out. One of their biggest attractions though is their BLT trio – a bear, lion, and tiger who live in the same enclosure and are incidentally best friends. Happy World Tiger Day everybody! Pingback: The She-Wolf of Kanta – Excerpt and Giveaway!